I'm so excited to post my first card as an ambassador for Graciellie Designs! When Gracie ask me (the end of last year) if I'd consider being a part of a design team she was putting together, I was thrilled to accept!! 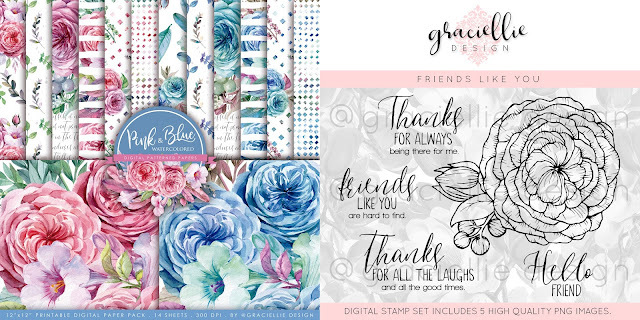 Gracie creates some gorgeous digital stamps and paper packs, and you're going to enjoy browsing (and shopping!) in her Etsy store! Today's card features her newly released paper pack Pink and Blue Watercolored as well as a sentiment from her new stamp set, Friends Like You. You can find both of these (and many more beautiful designs) at Graciellie Designs. 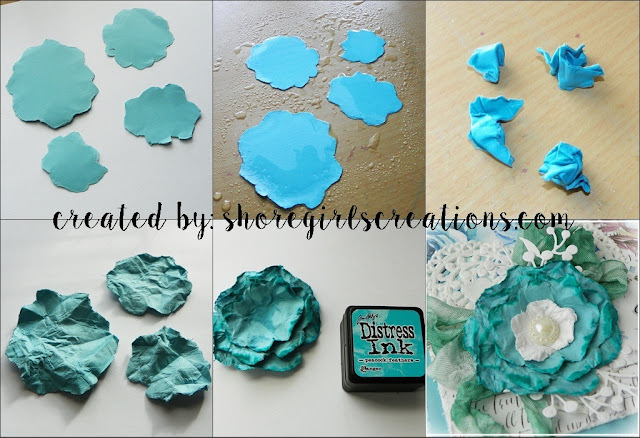 I've designed a mini tutorial for you on creating that pretty torn paper rose. Esther, I admire your card a lot. Agree with you, matching flower and papers are perfect and time-saving. Thanks for the inspiration, teamie! Oh, Esther, congratulations! I have long loved Gracie's artwork and digital paper, and she is blessed to have you on her team! I'm thrilled and absolutely love this card! The new paper pack is gorgeous, and you've used it well. Thanks for a super tutorial to make the beautiful flower! That's something I think I could do! Ha! You've really enabled me today! Warm hugs! Totally gorgeous! You do tattered to perfection! congrats on being selected for the team!!! That is lovely paper and pretty flower!! Love how you have embellished around it, isn't it funny how we forget old techniques, I haven't made a torn flower in such a long time, Love the pearl center you used also! Pretty card. Love those torn flowers. Congrats on your DT gig. Thanks for playing with us at 4 Crafty Chicks this week! Congrats on your new gig, Esther! This card is absolutely gorgeous!!! Congrats! You're perfect for that DT, Esther! This is absolutely stunning!